When I first started out in gymnastics, it was so hard to figure out where to find more information and where to buy the gear! Hopefully this resource page will help lead you in the right direction. Payton Snodgrass. Loving the stag handstand. Gym Directory: To get started in gymnastics, first you will need to find a gymnastics gym near you. Use the gymnastics gym directory to search local gyms that offer gymnastics classes. What to Wear to Gymnastics Class: More in-depth explanation of what to wear to gymnastics class, but basically girls should wear leotards which you can buy below. Amazon Gymnastics Store: Amazon has a full selection of gymnastics equipment, leotards and other gymnastics supplies. Deary’s Gym Supply: DGS sells all kinds of gymnastics equipment, supplies and apparel. Destira: Destira has a nice selection of quality and relatively inexpensive gymnastics leotards online. Norberts: Norberts has some great folding panel mats along with cartwheel and beam mats that are perfect for home use. Their sectional floor beam is also a great piece of gymnastics equipment for the home. Zulily: It can be hard to find nice, high-quality gymnastics leotards online, but I’ve found that every couple days Zulily has a flash sale of different brands of gymnastics leotards. I’m a subscriber and I check periodically. 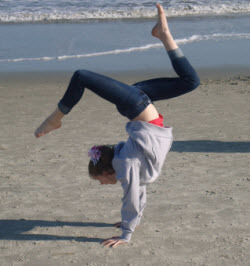 GymnasticsHQ’s Gym Rat Gear Store: Gymnastics tanks, t-shirts, shorts and pants for gymnasts and a couple for Mom too! GymnasticsStrong: Gymnastics Strong has strength and conditioning videos specifically designed for gymnasts. They can teach you gymnastics conditioning exercises to do at home. Pro Tips 4 U: Pro Tips 4 U has a couple instructional videos done by Dominique Moceanu, including one on learning a back handspring. Gymnastics Videos: Beginning Gymnastics For Girls: Skills and Progressions DVD and Essentials for Floor Exercise and Vault featuring Olympic Champion Paul Hamm are the two DVDs available here. USA Gymnastics: They are the national gymnastics governing body. On this website you will find official rules and regulations for the different gymnastics disciplines: Artistic, Rhythmic, Acro and Trampoline & Tumbling (here is more information about the types of gymnastics). AAU Gymnastics: AAU is the governing body for amateur gymnastics in the US. AAU gymnastics has different rules and regulations than the more common USA gymnastics program. National Association of Women’s Gymnastics Judges-: Official governing body for gymnastics judges in the US. The website has official information on how to become a gymnastics judge and other gymnastics judge information. Here is my guide to becoming a gymnastics judge.